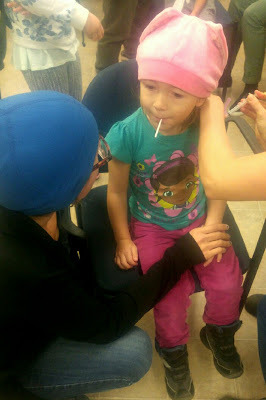 Yesterday we all got our flu shots at the local community health clinic. We got there about three hours into the drop-in, so they were out of Flumist, which meant the kids would have to get a needle this year. I thought it would be helpful for Oli & I to go first so the kids could see how it all worked, but Brontë was having none of it. She sat herself down on the chair & said, "I'll go first!" I suggested she sit on my lap while she got her shot & she vehemently refused. Okay, then! True to form, she chatted through the whole thing, sat still (well, still enough), & hardly reacted when she got the jab. Said it didn't hurt (thanks no doubt to the expert technique of the public health nurse who does this all the time!) & was excited to have the lollipop I'd brought from their Halloween stashes. Linny was really anxious, so Oli & I went next. I was hoping after seeing three of us get poked with no reaction, that Linny would calm down a bit & willingly sit for the vaccination. No such luck. We could have waited, banking on the next drop-in flu clinic in early December to have a supply of the nose spray version but Linny is the most at-risk person in our household because of his asthma, so I really wanted to get his shot done with as soon as possible. He generally only gets asthma when he's sick & I really don't want to see what a virulent strain of influenza might do to him. So I sat in the chair & held him down on my lap against his protests. We managed to keep him still enough for the nurse to administer the shot & then he calmed down once it was over. I talked with him later that day & he didn't seem upset with us--I think he understands how important getting vaccinated is. He remembers being in the hospital for four days just before Christmas a couple of years ago. That asthma episode was triggered by a cold--just a common cold. We also talked about the importance of keeping ourselves healthy to protect people we know, like his baby cousin, his elderly grandparents, his friend who has epilepsy, another friend with cancer, & all the other people we come into contact with who are at higher risk of serious harm from the flu. If you haven't got your flu shot yet, it's really easy to do! 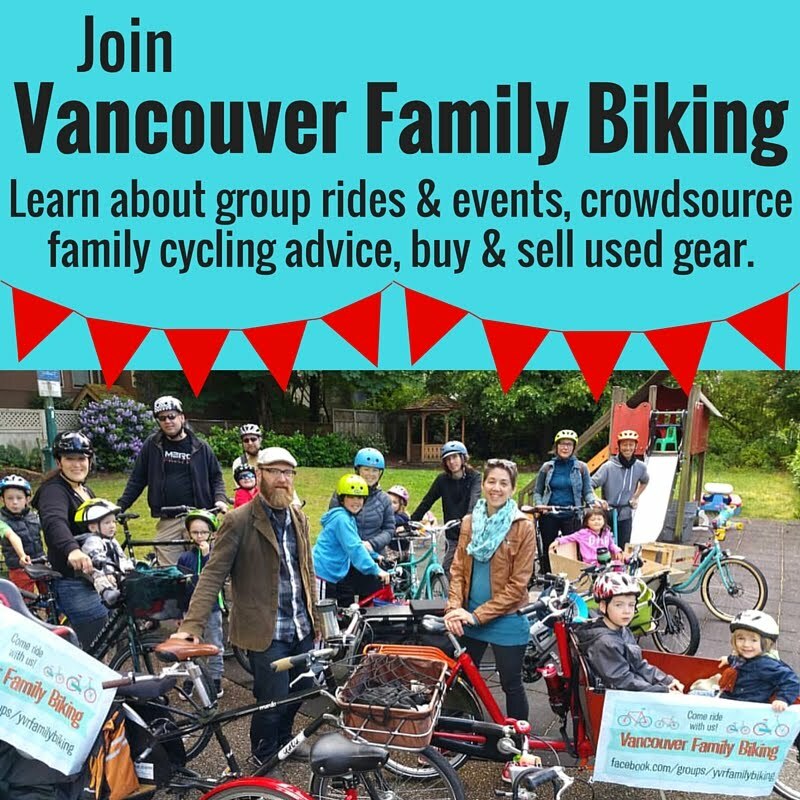 It's free for anyone in a higher risk group, or who is a household contact, though at the public health clinics, they will probably vaccinate anyone regardless. Your doctor can do it, pharmacies administer flu shots & there are often drop-in clinics at workplaces, shopping malls & other public places. For more information on where to get your shot in Vancouver, visit the VCH Flu info page. 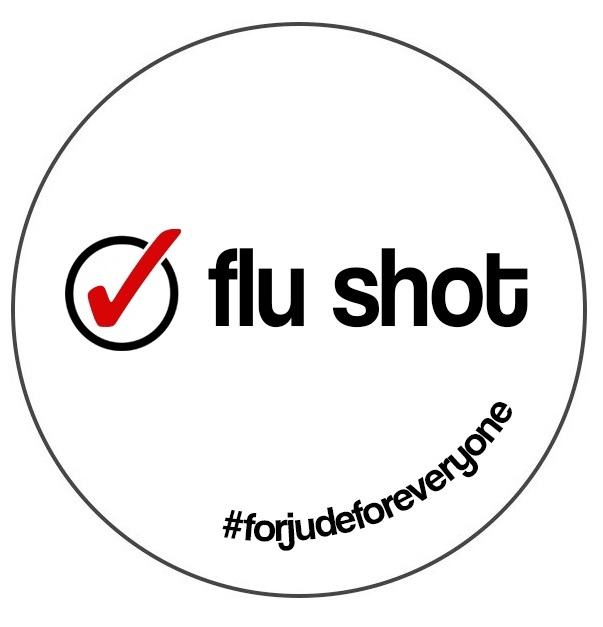 If you're outside the City of Vancouver, including all of Canada & the USA, see the Flu Shot Locator on For Jude For Everyone. 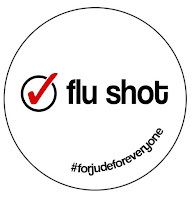 By the way, For Jude For Everyone is a great resource for information on the flu & a reminder of the potential tragedy that can come of influenza. Jude was a two-year-old who died of Influenza B in 2016 after contracting it from his older sister. The site is part of a campaign that his family launched to prevent more deaths from influenza.